Body language is a distinguishing trait that feeds the senses of those within sight; an integral aspect to sports, and notably so in hockey when the feat of scoring a goal is achieved. 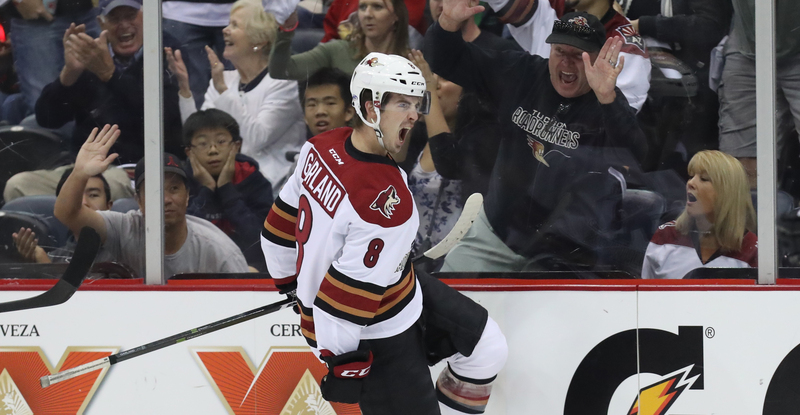 Goals have come in healthy bunches for the Roadrunners this season, a club that is fourth in the American Hockey League in offensive production with an average of 3.73 scored per game and a total of 41 put away on the campaign. 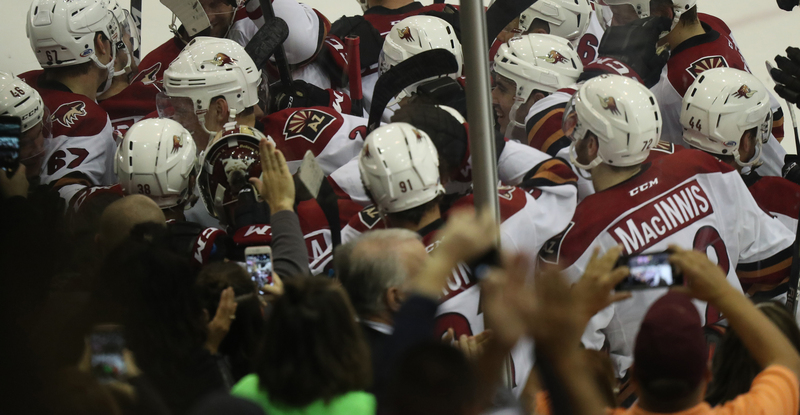 The Roadrunners got behind Bakersfield’s goaltending on 10 occasions this past weekend, and a combined 23 times against opponents during their now completed six-game home stand. The elation manufactured, both from the spectators and with the players on the ice, produces a moment of genuine frenzy that is nearly impossible to replicate. So, for the goal scorer, what initiates and idealizes the celebration to come mere seconds after the puck crosses the goal line? Are celebrations premeditated? Not always. But, in the back of their minds, players know their typical procedure. 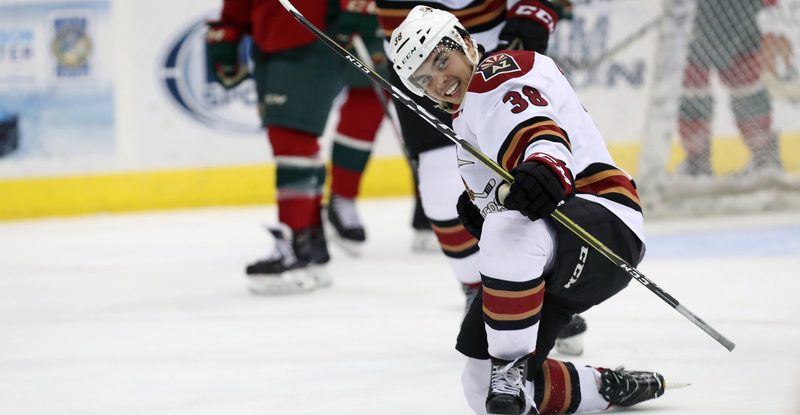 Nick Merkley, who’s eight goals scored this year leads the Roadrunners, has come to know the feeling all too well in his first pro season. The 20-year-old has adopted a routine this season of dropping to one knee, sweeping the ice with his glove or going with a quick fist pump, and popping up to join his teammates in a hug, a now habitual celebration he says is new to him. Important for Merkley is making sure the teammates who helped trigger the play that culminated in a goal are involved. The home crowd does make a difference, and the players do feel their presence. But then again, there’s something special about finding the back of the net in unfamiliar territory. For as fulfilling as a goal scored in front of a roaring, supportive crowd can be, sometimes having the adverse effect on those rooting against you can be just as sweet. 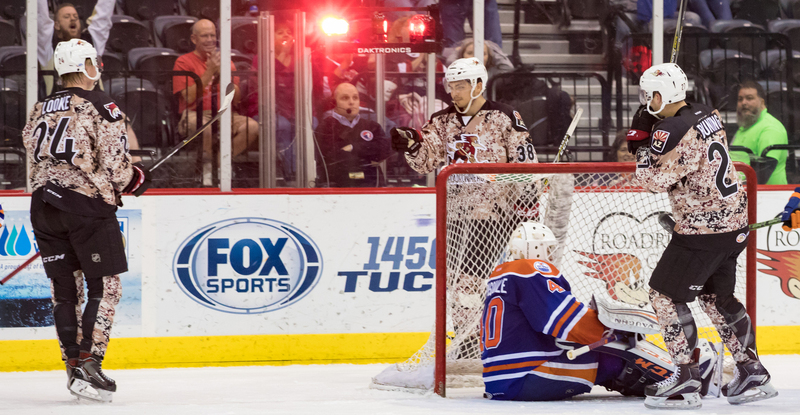 The Roadrunners will be seeking the sound of silence on a few occasions this weekend when they enter the unfavorable confines of San Diego’s Valley View Casino Center.